The dust has settled on yet another great week in the club. Well done to everyone who took part in sportives, charity spins and open racing, the club colours were really out in force!! 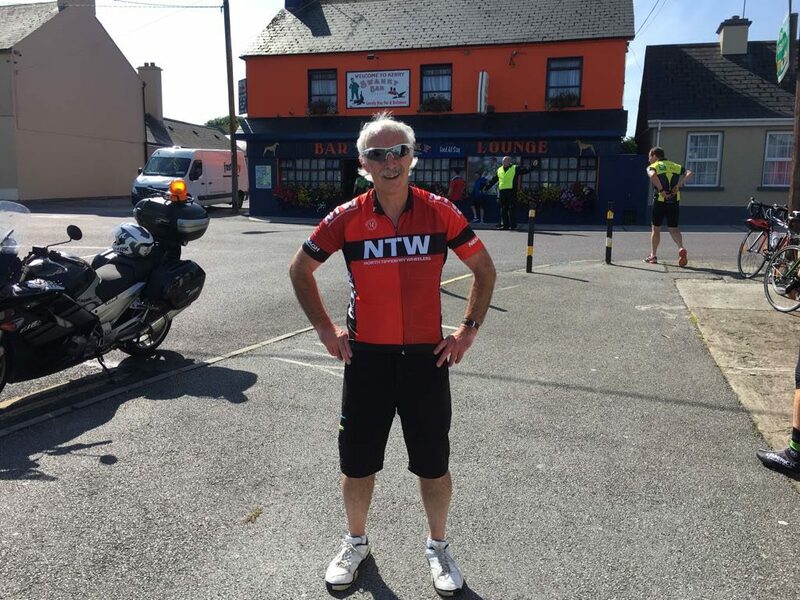 A few photos below of Ronan Dodd who took part in the Limerick 95 charity spin to Kilkee via Tarbert on Saturday. Looks like you had a great day Ronan, very well done. 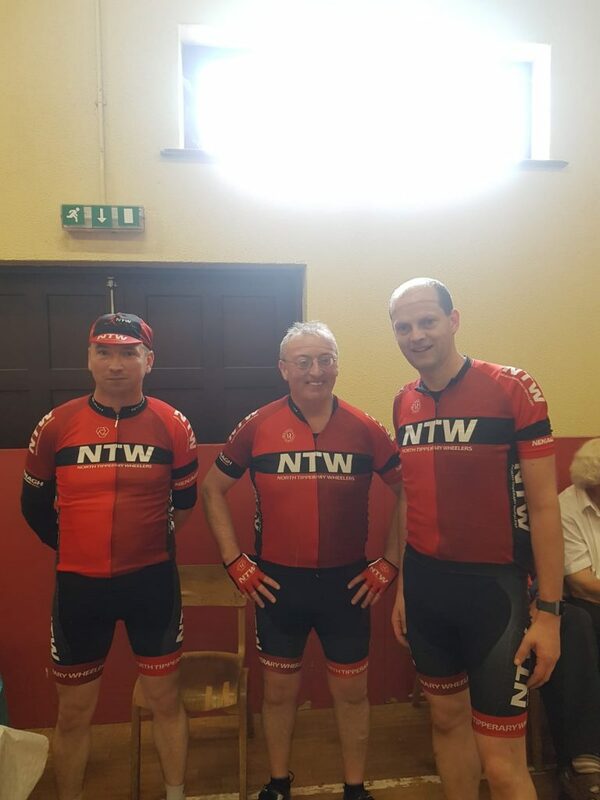 Sean, Roger and Pat at the UDCC tour on Sunday. Missing from picture Fergal Walshe. 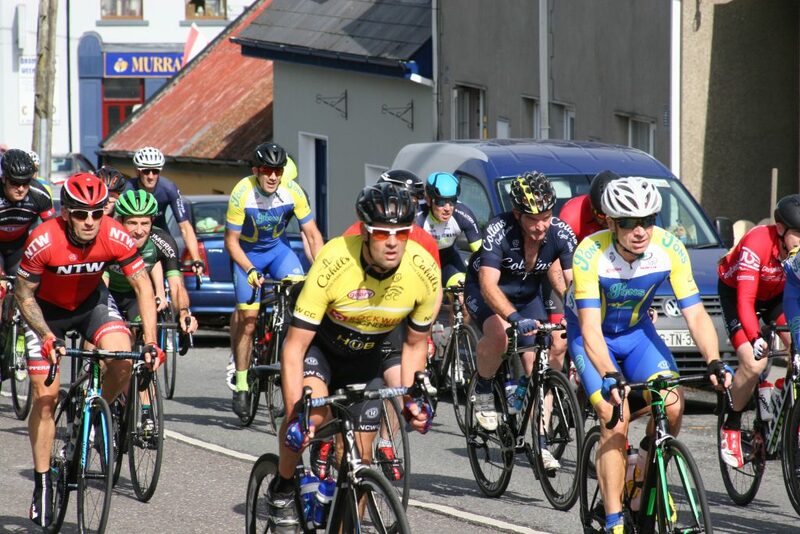 Well done to the lads who took part in the UDCC Upperchurch Drombane cycling club tour on Sunday. As usual well done to UDCC, a fantastically well organised event. 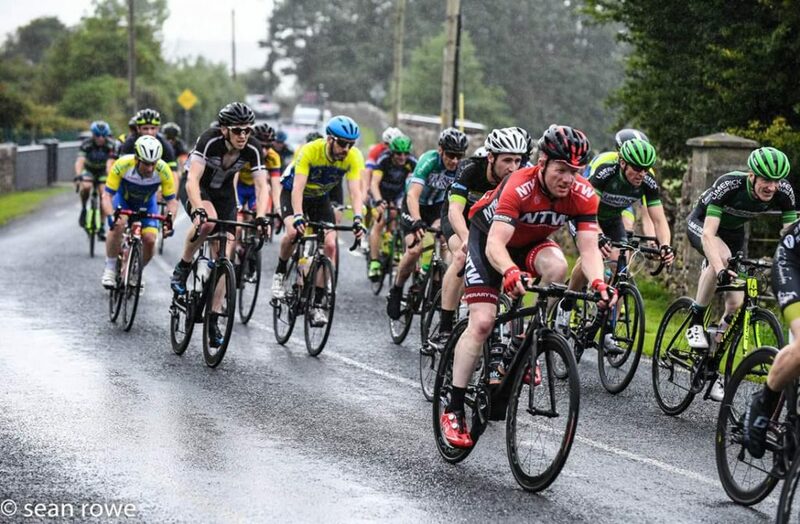 There was a huge entry for this years Charleville 2 Day, a race that indicates the end of the racing season for most and its a very tough two day energy sapping event, but one that everyone seems to come back to do every year. 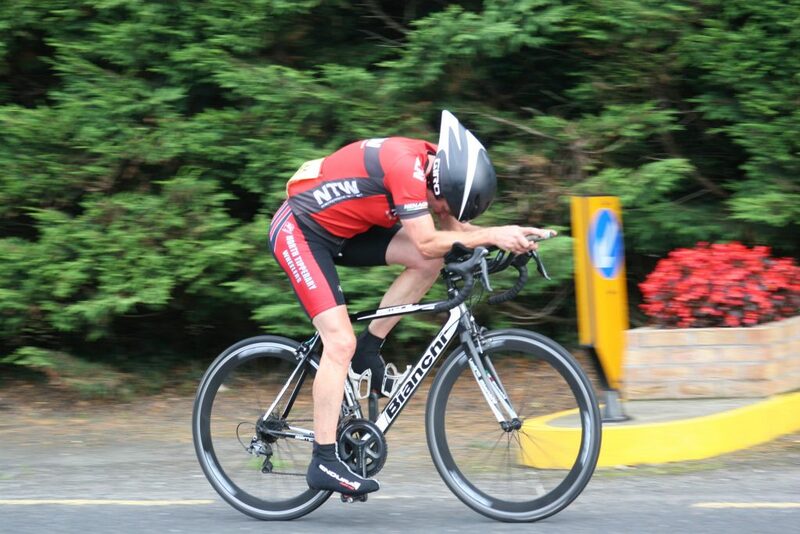 We had 6 members racing at the weekend. Daniel Ronan, Owen Hynes, Michael Crowe and Nanno Vuyk in the A4 category and Eoin Woods and Joseph Donnelly in the A2/A3 category. The weather was ideal for racing on Saturday with light breezes and sunshine throughout. 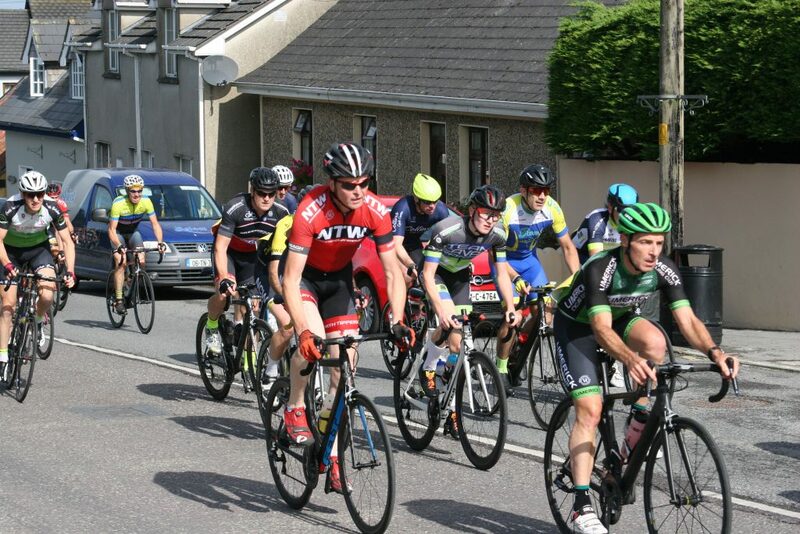 There was a neutralised zone for 3k out to the race start which was on the outskirts of Charleville town. 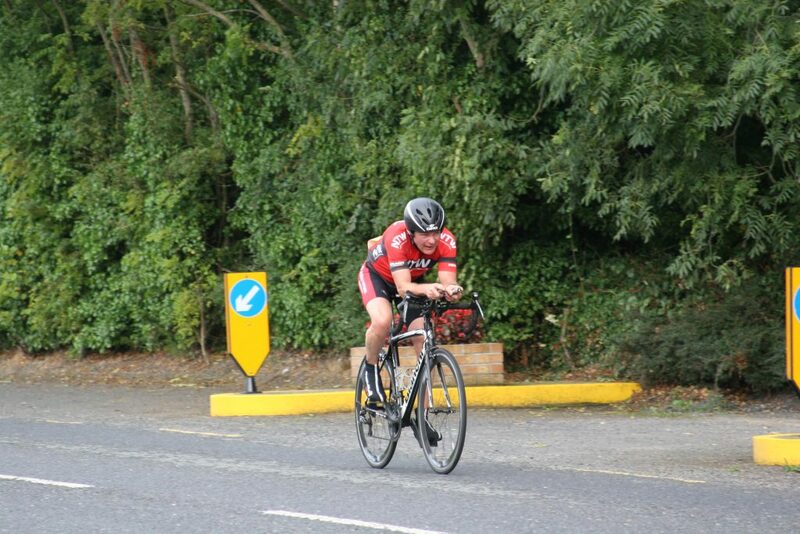 The race consisted of 3 laps covering 86km of rolling roads with a few hard kicks thrown in for good measure. 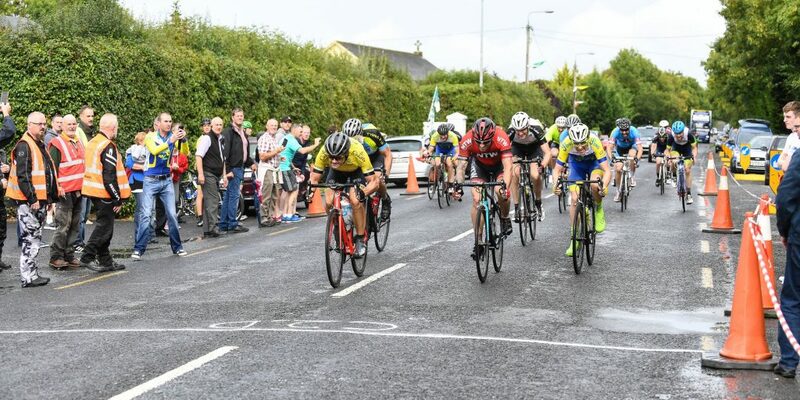 The route took them to Dromina, Dromcoliher, Milford, Newtownshandrum with the eventual finish on the main road back into Charleville on the R515. The Peloton held mostly together for the entire race despite several attacks being attempted but were shut down before they became a threat and so Dan, Mike and Owen finished safe in the main bunch sprinting to the line and losing no time on GC and Nanno finished a few minutes back but importantly everyone was safely home. A few photos thanks to Selina of stage 1. 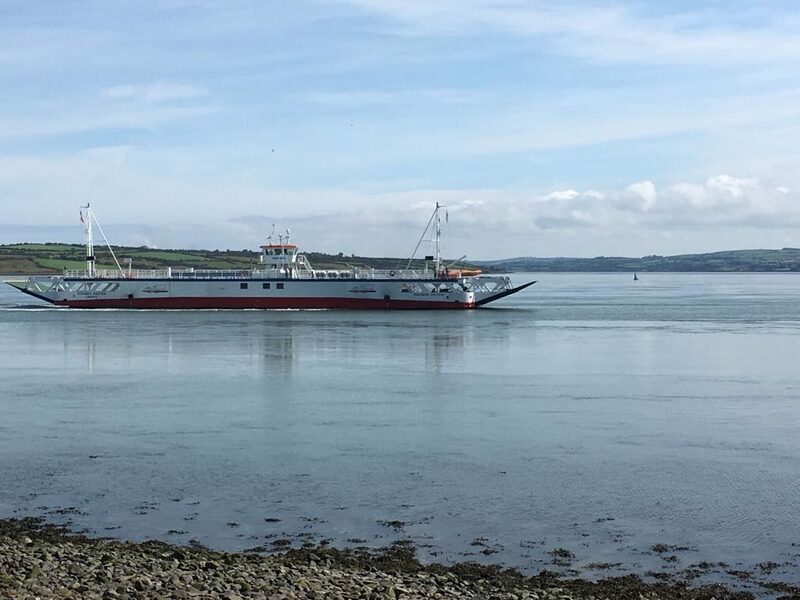 Eoin Woods and Joseph Donnelly were taking part in this race. They had to cover three laps of the same course as the A4s. 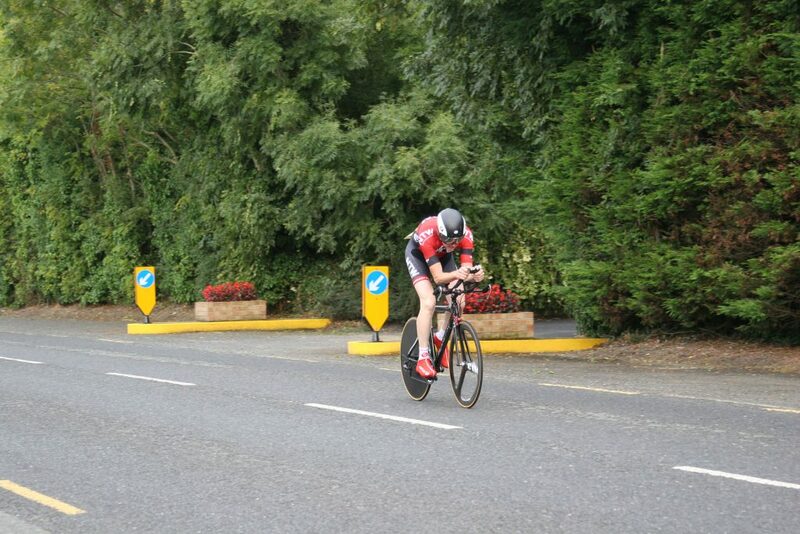 Eoin Woods finished safely in the main bunch. Joseph unfortunately did not finish the course but gained some valuable race experience from the event. Well done lads. 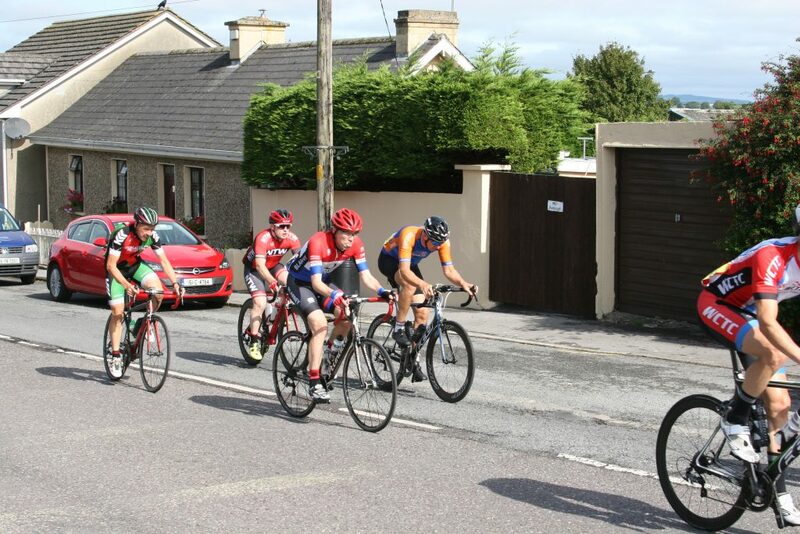 After a two and a half hour wait between stages, Stage 2 was a little over 6km Time Trial from outside Kilmallock town to Garrienderk just outside of Charleville town. This was a flat course aside from a little humpback bridge, so as expected there were going to be some very fast times recorded. 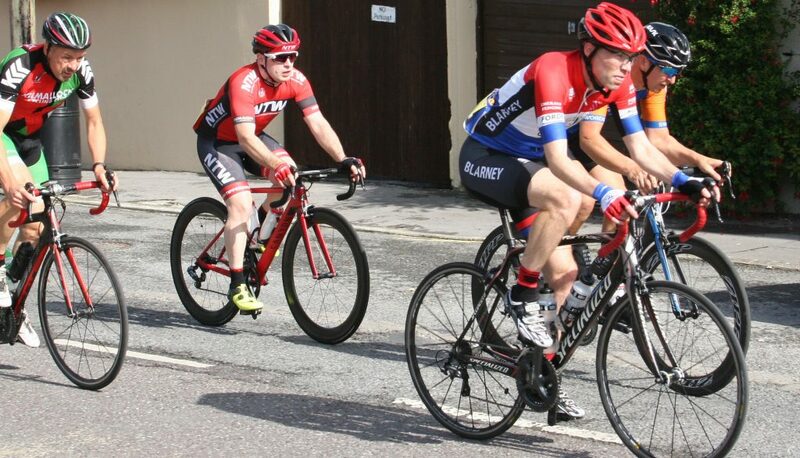 Michael Crowe 8’41”, Daniel Ronan 9’05”, Owen Hynes 9’27”, and Nanno Vuyk 9’34” so after two stages that left Mike in 8th overall on GC and in the team event, they were lying in 2nd place. 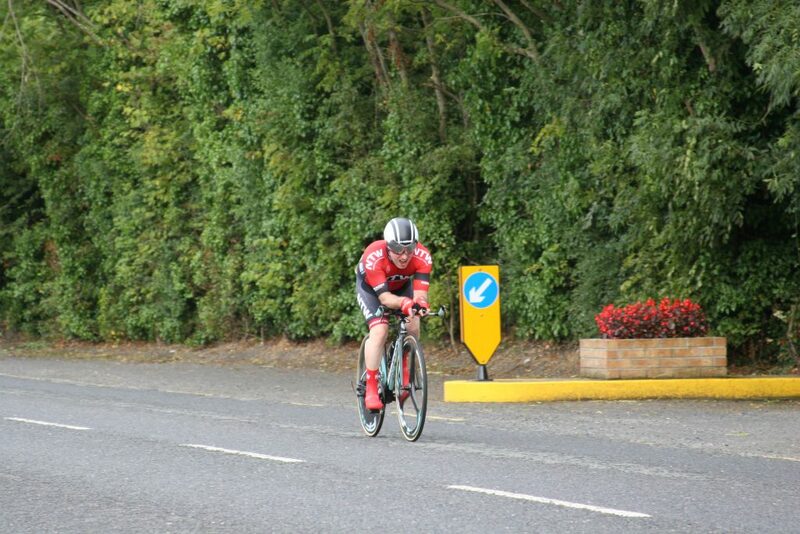 A few Photos thanks to Selina of A4 TT stage 2. The A2/A3 second stage always takes place on the morning of day 2 and this meant an early start for Eoin on Sunday Morning. There was a strong breeze blowing out on course and it was a headwind all the way to the finish line. 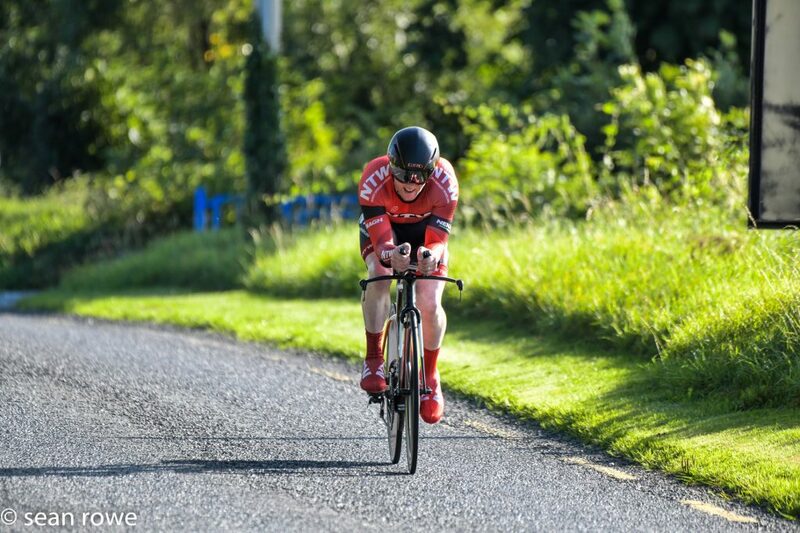 Despite this, Eoin dug deep and had the fastest time on the morning of 8’14” which is just incredible and with that secured him the stage win. Huge congratulations Eoin!! 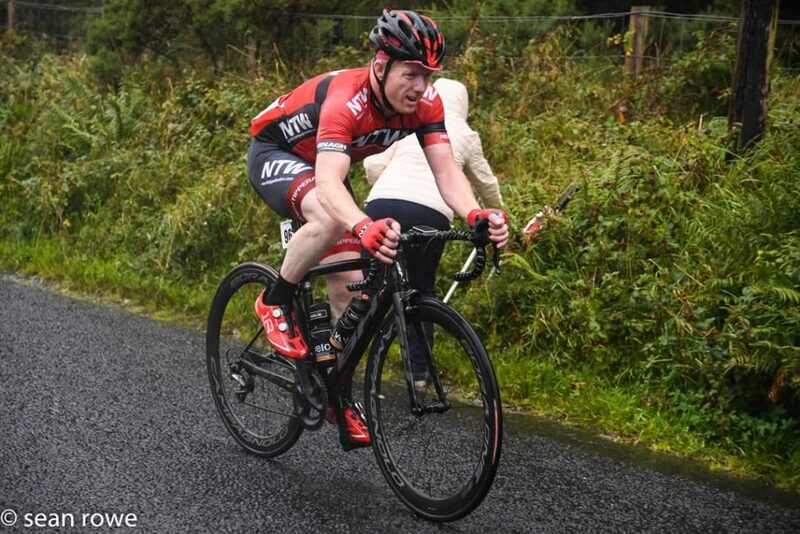 After Eoins TT stage win that morning he was going into stage three 3rd overall on GC and this was a day for the climbers, a day for conquering the mountains of Ballyhoura, not once but 2 times. Unfortunately the weather took a turn for the worse in the afternoon and heavy rain started pouring down making descending the mountain road treacherous and after an hour and half of racing Eoin was stopped in his tracks by a crash right in front of him but luckily stayed upright himself but getting around the crash cost him enough time to lose contact with the main bunch and after trying but with no group to work with to try and close them down, decided to call a halt to his race. 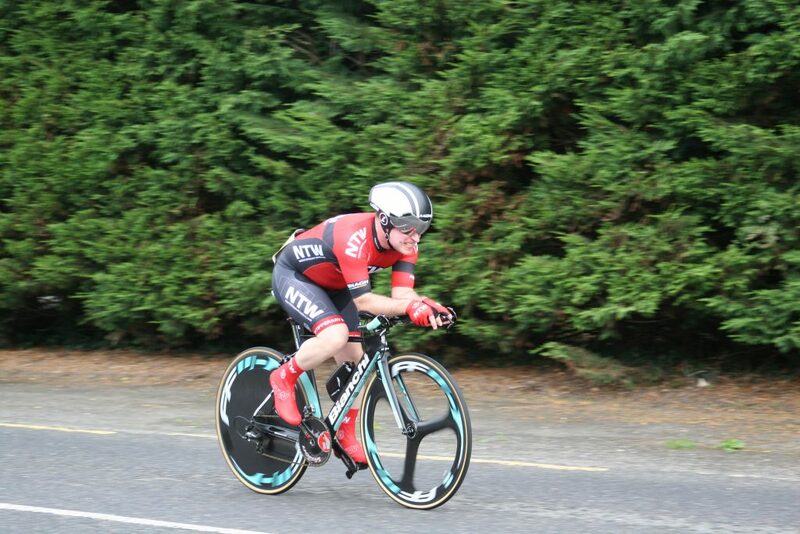 Hard luck Eoin but a superb performance out of you at the weekend and a great win in the TT netting you some valuable points. Onwards and upwards to next weekend! Photos thanks to Sean Rowe. 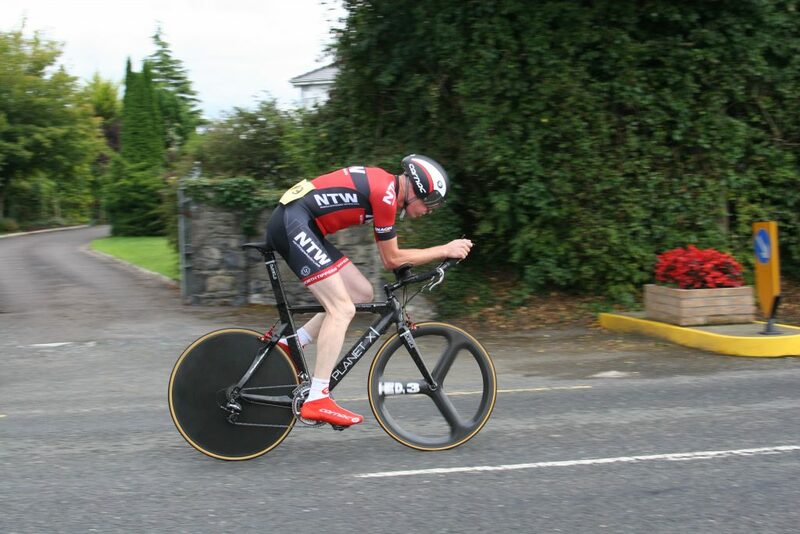 Eoin Woods who took the Stage 2 win in the morning TT in the Charleville two day. 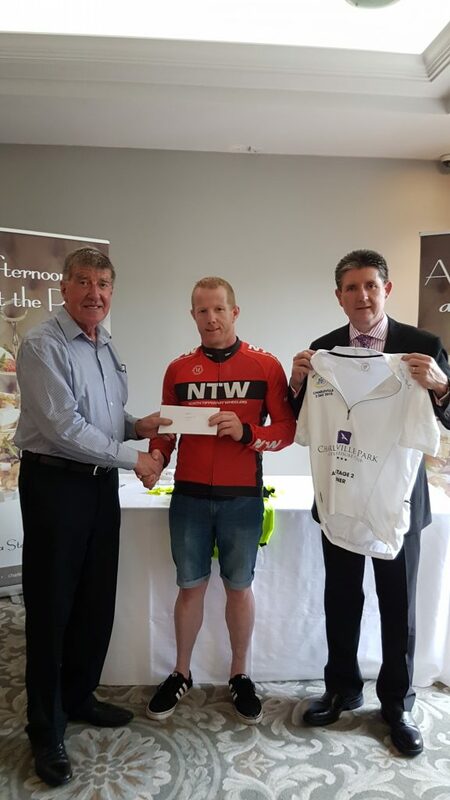 Pictured collecting his prize and the winners jersey from Counsellor Ian Doyle left and General Manager of the Charleville Park hotel Declan O’Grady right. The third mountainous stage was all that was left to concur for the A4s but this stage is never an easy task with the route being the same as the A2/A3s. 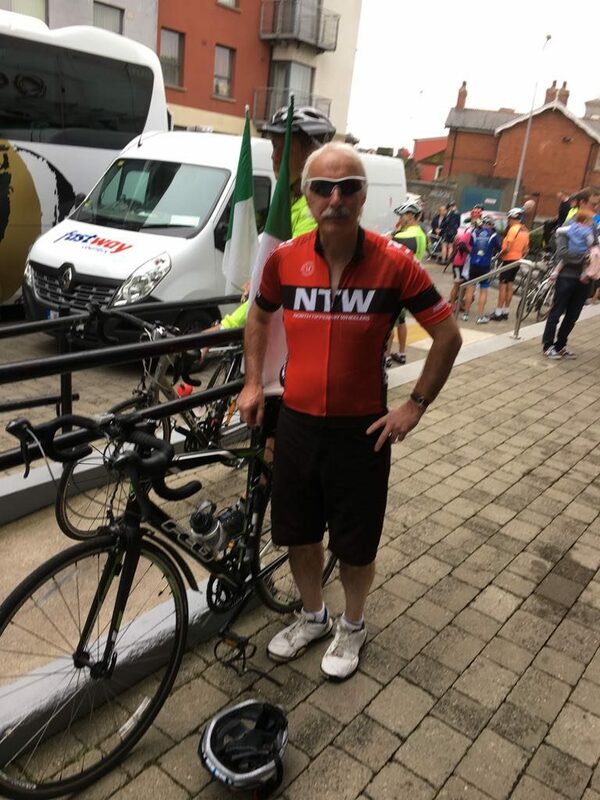 The Ballyhouras is a tough climb and to have to take it on twice racing is no easy feat… Daniel thankfully didn’t get caught in any of the crashes that happened on the descent off the Ballyhouras and managed to stay with the main peloton throughout. 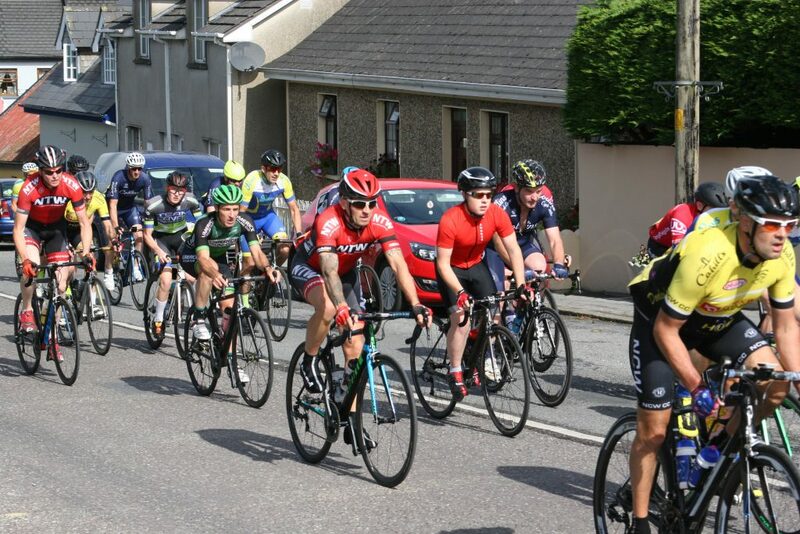 There was a big attack from one of the Kilmallock riders on the first ascent of the main climb of the day and he put in a superb effort to pull out a big gap which went to nearly 3 minutes at one stage! However the GC leader had a strong team protecting him and it was always going to be difficult to hold a solo break but he deserves some serious kudos for the effort as he was only reeled back in with about 4km to go by a very hard working peloton! 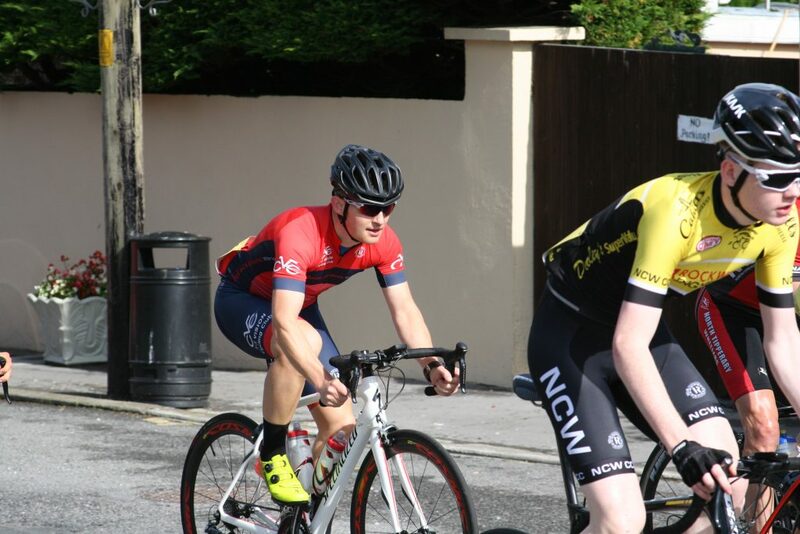 Daniel was one of the instrumental riders here driving the pace on the way in and still had enough left in the tank to contest the sprint to the line, taking a brilliant second place and with this placing, Daniel is now upgraded to A3 ranks!! Superb result Dan and really well deserved!! 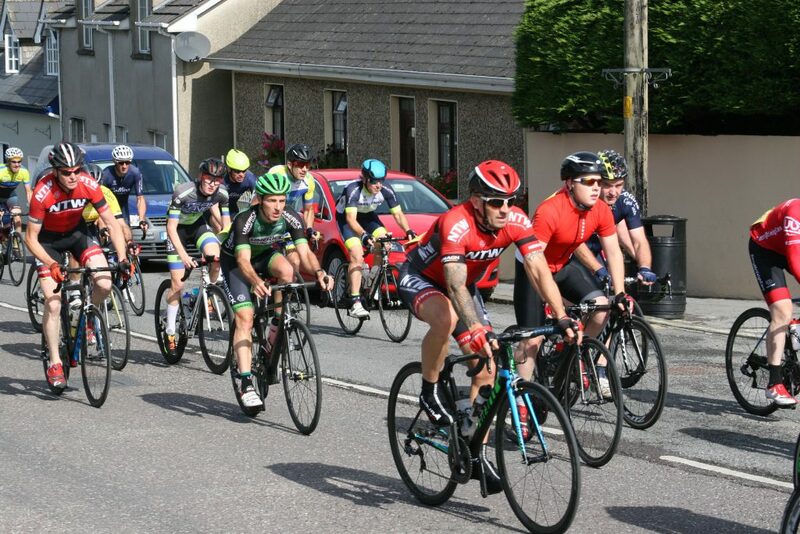 On GC Dan Ronan finished 10th, Michael Crowe 24th, Owen Hynes finished 33rd and Nanno Vuyk finished in 48th place. Well done lads. In the team event NTW team consisting of Daniel Ronan, Owen Hynes and Michael Crowe placed 4th. 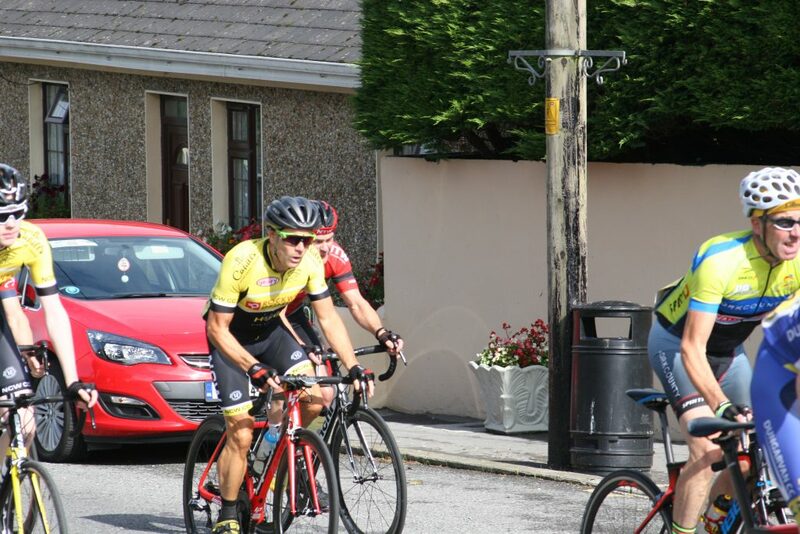 Daniel took a fine 2nd place in the final sprint to the line on stage 3 of the Charleville 2 day. Picture by Sean Rowe. 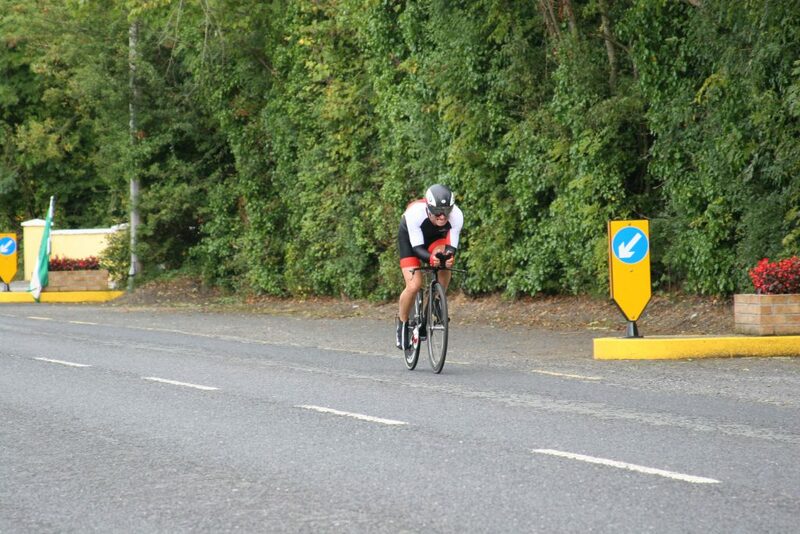 Daniel Ronan who took 2nd place at the Charleville two day stage 3 race and is now upgraded to A3. 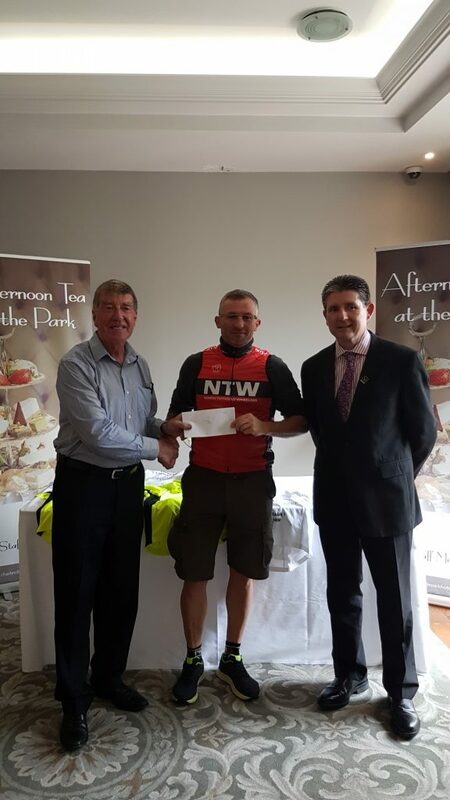 Pictured collecting his prize from counsellor Ian Doyle left and the general manager of the Charleville Park Hotel, Declan O’ Grady to his right. You can see the great photos by Sean Rowe of the A4 race from stage 3 in the link here and the A2/A3 race in the link here. To see full results and final GC placings you can see the full details in the link to Sticky Bottle here. Big thanks must go to John Foote, Liam Callaghan and Selina Hynes for giving up their time to drive support cars for the event and look after everyone so well over the two days! Final call everyone, if any of you would like to order any club winter gear can you please let us know by Friday next, 7th of September. 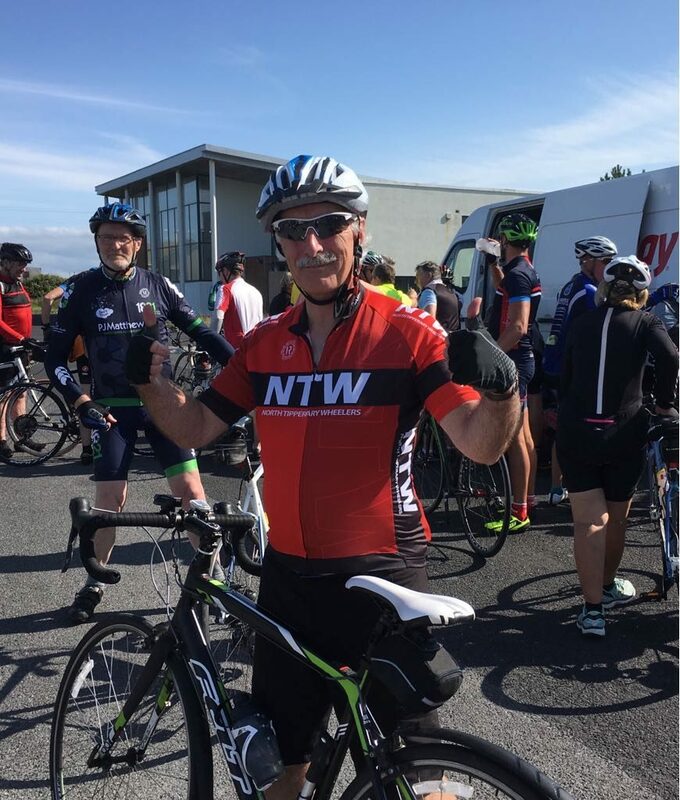 Tuesday: club training spin leaving from Moynans bike shop Nenagh at 6:15pm. Please note the change of time as the evenings are well and truly closing in now. Don’t forget it’s the time of year to start using lights and Hi-Vis again. 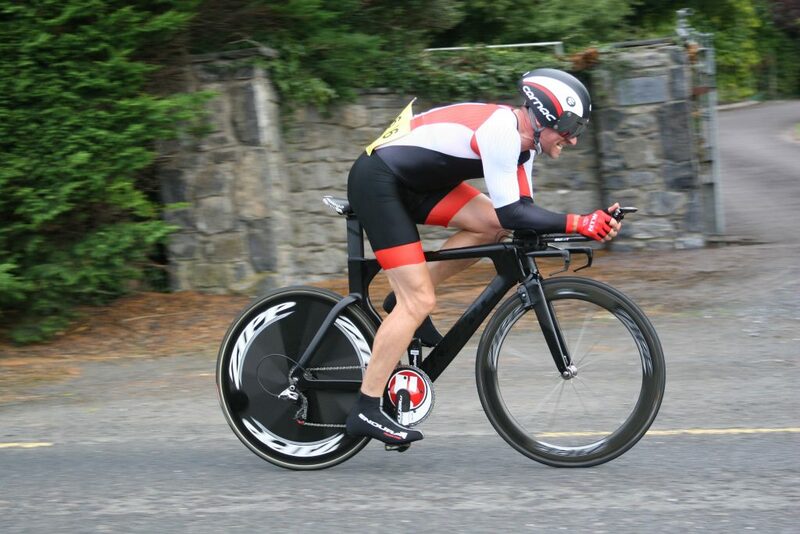 Thursday: club training spin leaving from Moynans bike shop Nenagh at 6:15pm. We would advise you all to bring along some high vis clothing and lights for the bikes as the evenings are much darker. Be safe be seen. 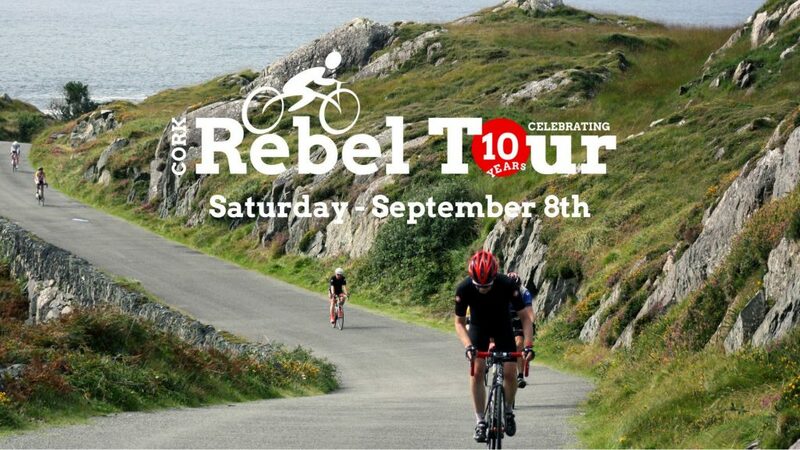 Saturday: Very best of luck to everyone doing the Rebel Tour. Also starting on Saturday is the National Masters and A3 championships. The Time Trials are being held on the Saturday with the road races being held on the Sunday. More details are available here and we wish all of you taking this on the very best of luck! Sunday: Club spin leaving from Moynans bike shop at 9am. Everyone is welcome to give these spins a go.